Design your OWN Goalkeeper glove Competition. Would you like to have the chance to have your VERY OWN goalkeeper glove design worn by goalkeepers all over the world? Well now you can thanks to the Just4keepers Goalkeeper Glove design Competition! Goto this page, see the quality prizes, including free Goalkeeper Training if you win this competiton! 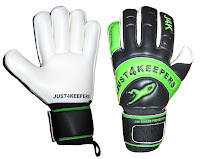 The Just4keepers 5 day Goalkeeper Camps in August 2011 have now gone live! Please Note: This is discounted until December the 20th, so pay your deposit now to secure your £50 discount! However, do you have the right goalkeeping coach? If you are going to a GK Coach who has played not at a good standard (or no standard) and has just taken their level one or two Goalkeeper badge, is this coach really going to help you develop? Probably not! So why not bring your goalkeeper to a Ex England International to be coached in goalkeeping? Please do not think I am knocking dads who have taken their badges to help youngsters, as I have a lot of respect for dads who have done this. But it is obvious a young keeper will develop more getting taught by an ex international. If you would like a free goalkeeper training session, please call J4K on 0151 222 3657 and we can offer you a free GK session with a ex professional goalkeeper who has played Internationally. Goalkeepers now are spoilt on the Wirral of where they can get Goalkeeper Coaching in Wirral. However, are you going to the right coach? If you are going to a GK Coach who has played at a good standard (or no standard) and has just taken their level 1 or 2 Goalkeeper badge, is this coach really going to help you develop? Probably not! If you would like a free goalkeeper training session, please call J4K on 0151 222 3657 or email info@just4keepers.co.uk and we can offer you a free GK session with a ex professional goalkeeper who has played Internationally. Would you like to attend Goalkeeper Training in Peterborough? If yes, and you would like to attend a free goalkeeper coaching session, please contact Ian Pledger of Just4keepers on 07872 630958. Here's a quick tip when choosing a good goalkeeper school - check out the results of past students. If students who have been training with the coach for a long time have not been successful, then watch out! A reputable goalkeeper school will have testimonials and success stories from their students - and what better proof can you have? Alot of goalkeeper schools think its all about them, and are only interested in stroking their own ego's. what most forget its all aout the students and this is one of the reasons why Just4keepers continues to grow. Please see the testimony letter from a parents below. Now these guys have not attemded J4k for 2 YEARS. but this is the impact that J4K has had on a young mans life... this is what coaching is about, HELPING OTHERS... its not about the coach! Hope you are ok,just thought I would keep you up to speed with what Kris is up to these days,as have not touched base with you for almost 2 years. After he left just4keepers he had trials for Cheshire under 18s and was selected to represent mid Cheshire in the cup run of 4 games.The 1st game was against Altrincham which really was their reserve team and they were the strong favourites,however after conceeding a goal Kris team won 2 – 1 but he was brilliant in last 20 minutes keeping them out.After that they lost the remaining 3 games and did not qualify for final. The manager of mid Cheshire asked Kris to come and play for Middlewich Town reserves,which he did and played for 1 season.He played in 1st team for cup semi and final which they won.The players who were aged between 18 and mid 30s were impressed with Kris and he was voted players player that season.Despite pleas from players Kris wouldn’t sign last season as he was going to Salford uni to persue his passion of music and tv and film production. Words from yourself of always put education 1st still ring in my ears and this is what kris followed. All last season he never bothered with football at all and concentrated on achieving high marks in uni, which every credit to him he achieved..As he resides in Salford his boots and gloves remained at home. About 4 weeks ago Kris asked for us to buy a cheap pair of gloves of which we assumed was for messing about with. Anyway last Wednesday he rang and told us he had had his 1st trial to represent uni team which was surprise to us. Yesterday he had 2nd trial, and out of 120 guys on trial only 4 were picked for the existing 1st team as replacements and Kris was the goaly picked. Apparently they have 4 teams,1st,2nd,3rd and 4th.The captains told Kris they had never seen a goaly as good as Kris in the 3 years that they had been there. We are really proud of him, ok he has not been picked for pro clubs but he has proved that what he lacks in height he certainly makes up for it with what he can do in the nets. A major part of what he has achieved is down to you Ray, and we thank for your brilliant coaching over the years with Kris. Hope everything is going well for you with just4keepers as we think you are just brill !!! Will keep in touch and let you know how he is going. I know we all want to save money on buying cheap goalkeeper gloves, but doing this could be a mistake in most cases. Please check out this website that goes into alot more detail to explain to you about the dangers of buying cheap goalkeeper gloves. As most people know, the Just4keepers goalkeeper coaches in J4K hail from semi professional, professional and even international backgrounds. Below you will see our very own Darren Quigley who is the current Irish U23 International goalkeeper. The picture is actually not darren, but is actually Darren as a computer grafic on the Play station FIFA 2011! So if you are from ireland and live around the Wicklow and South Dublin area, why not go and get trained by our very own J4K Playstation Fifa goalkeeper coach! Goalkeepers or a parent of a keeper who type in the term Cheap Goalkeeper Gloves, normally tend to get the worst gloves on the market that wear away to quickly which means in the long run these goalkeepers end up spending more money through the soccer season on their keeper gloves. This is because cheap goalie gloves generally have poor quality and poor specifications, which means for the most part they will wear away quicker. Also cheap gloves again generally do not perform well, ie their grip will be very poor! You do pay for what you get i am afraid, especially with goalkeeper gloves. I understand some goalkeepers might not have a choice because of lack of money in the household so they have to go after the cheap goalkeeping gloves but did you know if you spent maybe just £5 ($8) on a pair of gloves that these gloves will last longer and perform well! So instead of going through say 6 or 7 pairs of cheap poor quality gloves each season, you might only go through 3 maybe 4 pairs, thus saving you money but more importantly you will have a goalkeeperglove that will perform for you. In my experience, if you spend less than £10 ($16) for a pair of cheap goalkeeper gloves, you will have the problems above. But if you can stretch that bit more to say £12-£15 ($20-$22) you will get a much better glove that will last longer, thus saving you money throughout the football soccer season.